The Schwyzer Laufhund is one of four varieties of Swiss Hounds, the other three being the Jura, Berner, and Luzerner. The title ‘Laufhund’ means ‘walking dog’, the name given to these scenthounds as they are not used with horses, but rather with hunters traveling on foot. Each variety specializes in its own prey, the Schwyzer being used with deer, hare and other small game. 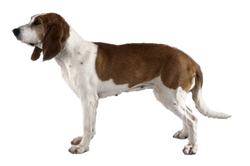 All of the Swiss Hounds are ancient breeds, each developed in a specific, isolated region in Switzerland. The Schwyzer Laufhund hails specifically around the eastern region of Schwyz. This variety descends from early French hounds and was never exported, making it the rarest of the four. In 1881 these breeds were separated by region, but they returned to a single standard with four varieties in 1993. Is the Schwyzer Laufhund Right for You?